The Mayor’s choice of Hackney entrepreneurs was celebrated this week (Tuesday 14 September) at a reception held for the winners and finalists of the Mayor of Hackney’s Business Awards 2010. 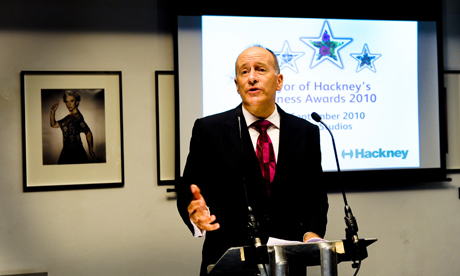 A team of judges from the world of business and media joined the Mayor of Hackney, Jules Pipe, in presenting awards to the local entrepreneurs at Holborn Studios, who hosted the event and sponsored one of the categories. However, one of the categories for the 2010 awards – the “Best Disabled” category – went missing. It appeared in the literature the council released to applicants but had managed to inexplicably vanish by the time the winners were announced this week. The Citizen asked the council for an explanation of disappearance. We received a reply telling us that there had not been enough nominations for a shortlist to be drawn up for this category. Even among those categories that did attract entrants, some attracted so few that any business that entered had a 50/50 chance of being shortlisted (the “Best in the Business” category, for example, drew only six entries, of which three were shortlisted). Whilst the council claims it is keen to promote “diversity”, the “Best Ethnic Minority” and “Best Women’s Business” categories, which were on the slate in previous years, were not included this time around. Asked to comment on this, a council spokesperson said: “In light of feedback from local businesses who had told us that they felt many of the categories were not relevant to them…we changed the categories”. The Mayor handed out awards to the winners with entrepreneur and business mentor Rachel Elnaugh, one of the original ‘dragons’ on the BBC’s Dragons’ Den and founder of Red Letter Days. Joining the Mayor on the judging panel were: Sinclair Beecham MBE, co-founder of Pret a Manger and owner of the Hoxton Hotel; Ian King, Deputy Business Editor of The Times and Hackney resident; Yvonne Thompson CBE, one of the founders of Choice FM; and Dave Blake, Publishing Director at newspaper group Archant London, which publishes the Hackney Gazette. The sponsors were: The Co-operative Bank, GLL, Groundwork and Holborn Studios. Pages of Hackney – independent Clapton bookshop stocking a wide range of books and hosting events, readings, art shows and performances in its basement gallery. Green Bottle Unit – manufactures striking and original 100 per cent recycled glass products for use in landscape, architectural and interior design. Boulevard Catering & Events – offering bespoke full-service catering and events solutions to a wide range of clients. They have also worked with Hackney Recruitment Partnership and Inspire to offer work placements to adults and young people. Dezeen Limited – design and architecture website with a global monthly readership of 1.5million. Renaisi Ltd – One of the country’s leading social enterprises specialising in neighbourhood regeneration and the delivery of local public services. HCT Group – founded in 1982 to provide affordable community transport services for the use of local voluntary organisations, charities and community groups, it has now expanded to run six red bus routes for TFL, as well as bus routes outside of London and a highly successful training programme.